If you are an experienced player, by now you might be familiar with many of the objects and colours that are significant in the Chinese culture. If you don’t know, gold is a symbol of wealth and riches while the horse in China has been said to symbolise victory, power and vitality. Those two very important aspects in Chinese culture are combined to create the perfect atmosphere surrounded by wealth and strength. Treasure Horse from Pragmatic Play is a majestic slot themed around a royal, golden horse and other Chinese symbols. 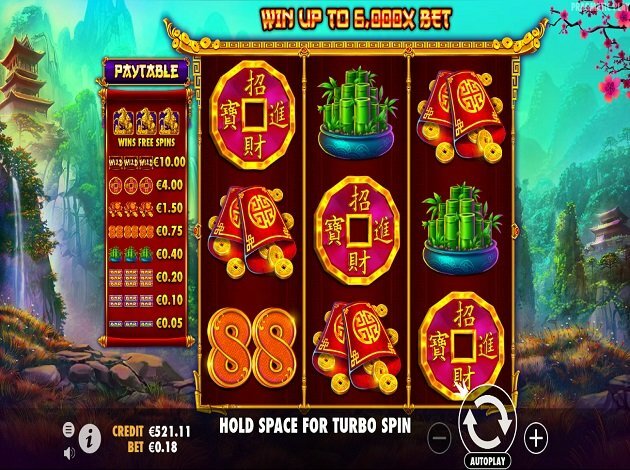 The set-up of this slot consists of three spacious reels and rows which has a total of eighteen paylines in this with a very fortunate RTP of 96.52%. Bets in Treasure Horse range from a minimum bet of € 0.18 per spin and go up to a maximum bet of € 36. The wild symbol is a red scroll with the word ‘Wild’ written across it in gold letters. It can substitute for all symbols except for the scatter symbol which is the majestic, gold horse which is engulfed in gold coins and riches. There are a few other symbols aside from these special symbols like a hot pink Chinese coin with gold characters on it, two red envelopes full of gold coins, two number eights, a bamboo plant and three bar signs. Three of the scatters will trigger the free spins round which once activated will grant you eight free spins! During the free spins round, a fourth reel is added to the screen which will contain only multiplier items. At the end of each spin, one multiplier is randomly chosen on the fourth reel which will then multiply the total win of the spin. During the free spins round, all symbols are stacked on the reels and every scatter hit during the free spins round will award an additional free spin without any limits! The hot pink Chinese coin with the gold characters on it is the highest paying symbol which can reward you with up to 22x your total bet! The next highest paying symbol are the two red envelopes which are full of gold coins, this symbol can earn you up to 8.3x your total bet. The two eights can reward you with up to 4.1x your total bet and the bamboo plant can award you with up to 2.2x your total bet. The bar symbol with three bars can reward you with up to 1.1x your total bet while the two-bar symbol can reward you with up to 0.5x your total bet. The lowest paying symbol is the single, blue bar symbol which can reward you with up to 0.2x your total bet. Treasure Horse is set in a beautiful valley somewhere between several large, mystical mountains. On either side of the reels you can see traditional, Chinese buildings. On the left hand side, you will see a small waterfall and on either side the long grass as well as the small wild flowers are swaying in the wind. When you enter the free spins round, the backdrop will turn to night with lightning bugs flying around near the bottom. There is a soundtrack playing in the background which features some musical elements like a wind chime blowing in the wind. You’ll also hear the water fall and birds chirping. There is somewhat of an eerie feel to the background music, but it’s still very serene and calming as well. Treasure Horse from Pragmatic Play is definitely a Chinese treasure in itself with some great winning potential thanks to the free spins round which for every scatter landed can reward an additional free spin throughout, without any limits! The game layout and gameplay are simple and easy to understand so players of all levels can enjoy this treasured slot. What’s more is that the graphics and animations are truly something special and life-like. Play Treasure Horse at Videoslots! Pragmatic Play – one of the greatest and fastest-growing providers of both online and mobile games for all devices you can think of. With enough games to sustain this claim, they are certainly an established game provider to keep an extra lookout for. Pragmatic’s main focus and goals are to keep players entertained, satisfied, and constantly looking for more. They have a way of reeling players in by creating and developing products that can suit all kinds of players, all tastes, while certainly being most rewarding. This is the way they have risen – amongst others. Gamers constantly seek thrills, action and high stakes. Pragmatic is aware of this and customises their creations after it to create the most fulfilling product they can for the players. Everything provided by Pragmatic is developed and made in-house, with content for over 150 certified and great games for both mobile and desktop. The goal of these games is that they will be the mantra of innovation and dedication to help shape the online gaming industry. Some editions by Pragmatic Play are Asgard, 888 Dragons and Chilli Heat.